Christmas is just around the corner! How exciting! I couldn’t help but notice when I went to our local shopping mall the day after Halloween that the shops had already disposed of their ghoulish decorations and that the first of the Christmas decorations had started to appear. I love all the sparkle, glitter and fake snow! I also love Christmas pudding and found it hard to resist buying one the other day when I was in the supermarket. It seems absurd to be eating Christmas pudding in November. But I bet I’ll be doing just that! The trouble is the choice! Waitrose offers so many different varieties. And the packaging has changed from last year. I can’t remember which was the one we liked the most! I’ll just have to try a few out before the big day! Which won’t be a hardship! Can anybody please recommend which one I should go for?! 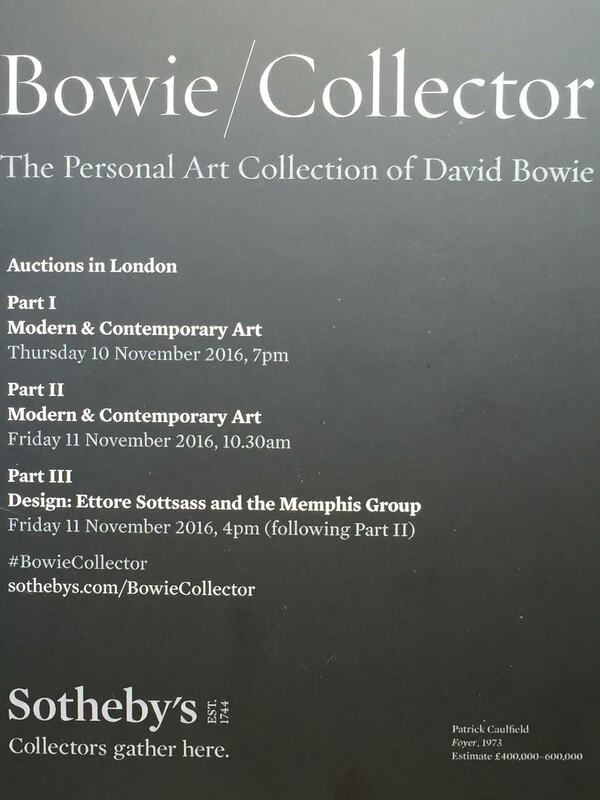 Yesterday I went with my mother and sister to Sotheby’s to view David Bowie’s Personal Art Collection which goes up for auction at the end of this week. And what a diverse collection it is. There were some wonderful pieces of furniture too. Alongside some amazing sculptures. I’m so glad that we went because it seriously was a wonderful opportunity to see a selection of artwork that had been chosen, loved, cherished and owned by David Bowie himself. I’ve posted the link below to Sotheby’s. Included are the viewing times. If you can get down there this week I would seriously recommend that you go before these wonderful works of art disappear from the public eye once again. Writing has definitely taken a back seat recently. In fact, almost everything has taken a back seat recently! Apart from the jigsaw puzzle which has totally and utterly overtaken my life! It’s very nearly finished as the photo below indicates. And then I shall return to writing! I seem to have started a puzzle craze amongst our nearest and dearest! 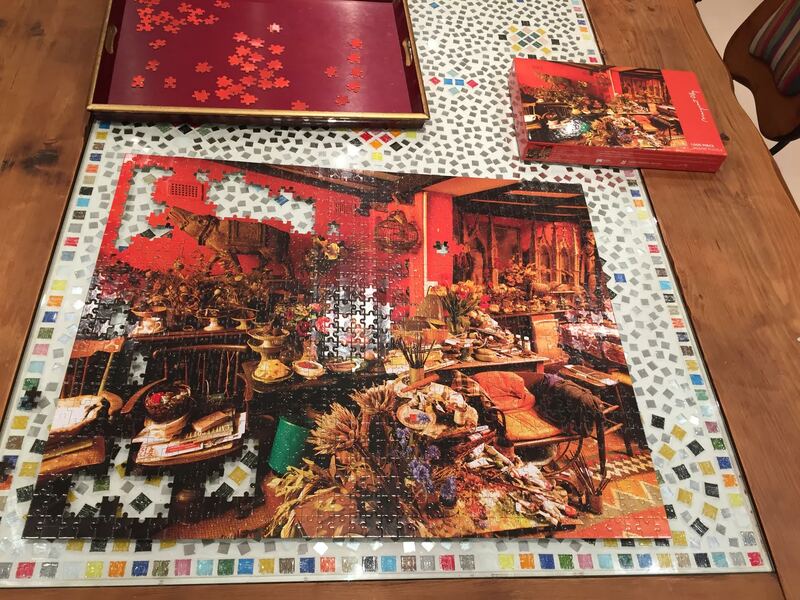 On Guy Fawkes Night we went to friends for supper who requested that I bring a puzzle instead of a bottle of wine. They were inspired after having seen ours a couple of weeks ago! I’m hoping that the next time I write my blog I will be able to include a photo of the completed puzzle! Puzzle progress – getting there! I’m also extremely excited to be able to say that as of today I now have 217 followers on Twitter! An all time high! I would like to say to the bloggers who I’ve connected with via Twitter, I’m really enjoying reading your blogs. In fact waking up in the morning has become a real pleasure for me as I check my phone and see all these emails that have come through from the blogs that I’m following. Thank you to all you bloggers for having opened my eyes to a whole new world!